These are a glamourous way to extend fashion to your fingertips! This can be use on fingers and toes, Envy Wraps mean you can create the celebrity look without the hefty salon price tag. I'm in love with these. I get compliments all of the time on them and no one believes that I do it myself. I've tried other brands but this is the best. I don't always have the time to go get my nails done professionally or wait for them to dry so this is a great alternative. They wear really well and look pretty awesome and they adhere perfectly! No wrinkles! No lifted areas on the edges! I'm currently on day six and no chips or tip wear yet! It took me about 10 minutes total, to push my cuticles back, applied base coat and file nails and apply. It was very easy and the sizes were perfect for me. Another perk is because it comes with 18 nail wraps, if you do happen to mess up a few there are extras and you can easily cut one, super fun. 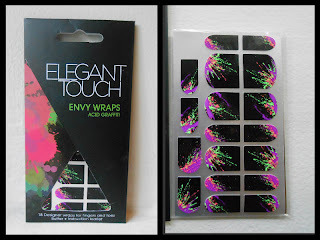 Elegant Touch is extending their offering of 3D texturized nail wraps. This came in 12 different designs. They look nice! I haven't tried nail stickers yet. Those are hot! =) Got to get me some of those.